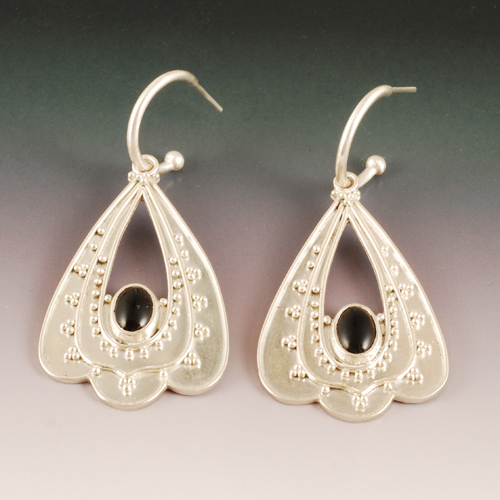 This week's class is Earrings, Mechanisms & Granulation. We have twice as many students, attesting to the popularity of earrings. On the first day, we made two pair. First up, twisted square wire hoops. Argentium is so malleable that it twists easily and beautifully. If you have an area that didn't twist the same as the rest, you just anneal the part you want to twist more, leaving the rest hardened, then correct the problem. Mine twisted perfectly the first time. The we cut 3/4 rings, melted some large balls and fused them onto one end of the rings. After that, we made tiny jump rings and soldered posts into the jump rings for extra support on the business end of the hoop. 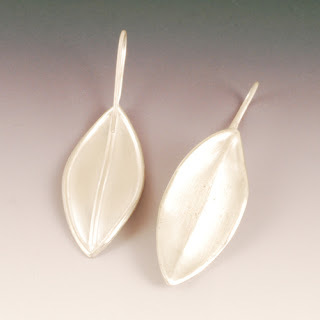 On the same day, we learned to deliberately slump Argentium to give "torch formed" leaf earrings. First the wires are shaped and laid on the sheet, then fused to attach. The sheet is flipped over and the temperature of the metal is raised until the silver begins to slump around the wires. The photo shows the front (right) and back of the earrings. The next day we started a complex pair of earrings involving granulation and bezel set stones. I drew my own design to be different, then spent a lot of time bending wire to fit and tack fusing the pieces together in the desired shapes. Eventually I got it all fused down onto the sheet and started forming bezels by fusing heavy, 24 gauge strip into ovals. I formed what seemed like an army of granules by cutting uniform lengths of wire and balling them on a charcoal block, then carefully set them into their places. For the last thing of the day, I fused it all down. This morning, I cut out the center and surrounding metal, filed and sanded, and began the process of stone setting. While I have set thin-walled bezels before, I've never had to move this much metal. i tried it two different ways, with a hammer and punch and with a hammer hand piece on the flex shaft. Now I know what I want for my birthday! Then I tried to learn to use a graver to "bright cut" the top of the bezels, but I definitely need practice at that. 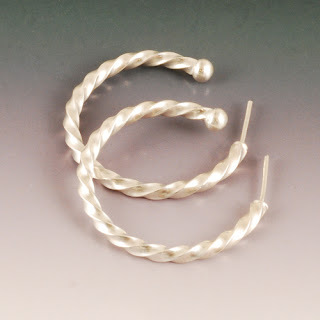 After I sanded and polished the bezels, I formed a small pair of plain round wire hoops to hold the dangles. I wish I'd given more thought to making these in keeping with my usual style, because they don't really appeal to me, but I think I'll have time for that on Friday.